It's being heralded as a silent revolution, a state of the art global tracking device, and as significant of an invention as the Internet or even the computer itself. What is this device? It's none other than RFID. 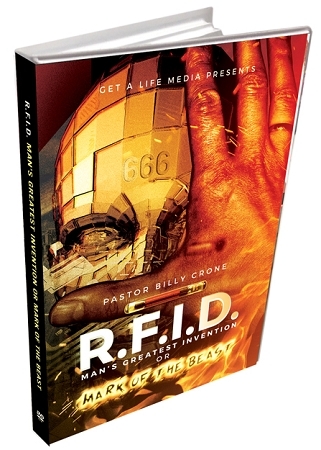 But with all the hoopla aside, the question we need to be asking ourselves is this, Is RFID man's greatest invention or Mark of the Beast? Yet the irony is that even though this technology is sweeping the planet, hardly anyone, even Christians, have any idea what it is in the first place, let alone its Biblical ramifications! Therefore, this series takes a look at three things to equip you with the facts concerning this planetary tracking device. First you'll see the Definite Concern of RFID and what this technology can do as well as what the corporations will do. Secondly you'll see the Dangerous Deployment of RFID and its current and planned usage to monitor and track everything from retail, food, shipping, transportation, medical, government, money, and everything else in between. And thirdly, you'll see the Dark Future of RFID with not only plans to monitor and track animals with an RFID implant, but humans as well. People, this is not a science fiction scenario of the future. It's present day reality with today's technology called RFID. And that's why the Mark of the Beast is not only real, it's really going to be implemented just like the Bible said. In fact, it might be sooner than you think.